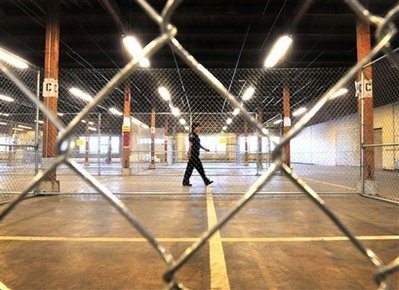 There won’t be razor wire, but anyone arrested during the Democratic National Convention will be held in locked chain-link cells in an old warehouse. he Denver County Sheriff’s Office unveiled the facility Wednesday, saying it was designed to mimic the functions of a real jail. The good news: There will be air conditioning. The bad news: 20 people to an 18-by-18-foot holding cell. The Temporary Arrestee Processing Center will open Sunday and remain operational until Aug. 31. Initially, officials had planned to top the cells with razor wire. But that was changed to chain-link in response to community concerns, Lovingier said during a media tour of the facility northeast of downtown in the Clayton neighborhood. Sheriff’s Capt. Frank Gale said officials don’t believe there will be widespread arrests during the DNC, but “we have to plan in case we would need it.” “No one’s going to be here more than a few hours,” he said. Activists have decried the facility, calling it “Gitmo on the Platte,” a reference to the American detention camp for suspected terrorists at Guantanamo Bay, Cuba. Similar comparisons were made in 2004 when New York City opened a temporary processing center during the Republican National Convention. That facility at Pier 57, off the Hudson River, housed about 1,800 arrestees. At the Democratic National Convention in Boston that year, six arrests were made at convention-related events, according to The Washington Post. Denver’s facility will be able to process 60 people an hour. It can hold 400. But it will house more than just those arrested during the convention. Anyone arrested on the east side of the city during the DNC will be processed at the facility, Lovingier said. “The purpose of that is so everybody that is arrested in Denver that week is treated the same,” he said. The exception is those arrested for felonies and domestic violence. They will continue to be booked at the city jail downtown. At the temporary processing center, those arrested will be photographed, fingerprinted and provided medical care and telephones. There also are stations where people can post bond. “Our goal is to get them through here quickly and to the courthouse, where they will have access to lawyers,” Lovingier said. Arrestees who post bond will be taken to the city jail for release. The holding cells will contain 20 chairs each, with water and food available. There will be 23 portable toilets inside and two more outside. Signs throughout the facility warn inmates not to touch or climb on the chain-link fencing. Other signs say that electric stun devices are used.